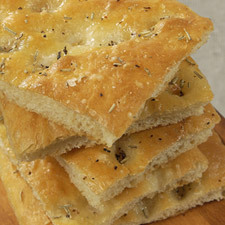 With its roughly dimpled surface and craggy interior, focaccia is perfect for dipping in flavored olive oil. This tasty flatbread will be light-textured, golden, and about 1/2" tall. Crisp when it comes out of the oven, it becomes chewier as it cools. *Use 1 tablespoon less in summer (or in a humid environment), 1 tablespoon more in winter (or in a dry climate). To make the starter: Mix the water and 1/16 teaspoon yeast, then add the flour, stirring till the flour is incorporated. The starter will be paste-like; it won't form a ball. Cover and let rest at room temperature for about 14 hours; the starter will be bubbly. If you make this in the late afternoon, it'll be ready to go by the next morning. To make the dough: If you're using active dry yeast, dissolve it with a pinch of sugar in 2 tablespoons of the lukewarm water. Let the yeast and water sit at room temperature for 15 minutes, until the mixture has bubbled and expanded. If you're using instant yeast, you can skip this step. Combine the dissolved yeast (or instant yeast) with the remaining dough ingredients, and mix and knead—by hand, mixer, or bread machine set on the dough cycle—to make a soft, smooth dough. If you're kneading in a stand mixer, it should take about 7 minutes at second speed. Place the dough in a lightly greased bowl, cover, and let it rise for 1 hour. Gently deflate it, and allow it to rise for another hour; it should have doubled in bulk from its original volume. Lightly grease an 18" x 13" baking sheet with a rim (or two 9" x 13" pans) with non-stick vegetable oil spray. Drizzle olive oil atop the spray; the spray keeps the bread from sticking, while the olive oil gives the bottom crust great crunch and flavor. If you're using the baking sheet, gently pull and shape the dough into a rough rectangle, and pat it into the pan. As soon as it begins to fight you and shrink back, stop patting. If you're using two 9" x 13" pans, divide the dough in half, shape each half into a rough rectangle, and pat one piece into each pan. When the pieces start to shrink back, stop patting. Wait 15 minutes; pat the dough farther towards the edges of the pan(s). Repeat once more, if necessary, till the dough is close to covering the bottom of the pan(s). Cover the pan, and allow the dough to rise till it's very puffy, almost billowy. This will take about 1 1/2 to 2 1/2 hours. Toward the end of the rising time, preheat the oven to 425°F. Gently dimple the dough at irregular intervals with your fingers, pressing down firmly, but not abruptly; you don't want to deflate it too much. Spritz heavily with warm water, and drizzle with 2 tablespoons olive oil (or enough to collect a bit in the dimples), then sprinkle with rosemary (or the herb of your choice), black pepper, and a bit of coarse salt, to taste. Bake the focaccia for about 10 minutes. Reverse the pan(s) in the oven (top pan on the bottom, bottom pan on the top), and bake until the focaccia is light golden brown, about another 10 minutes. Remove it from the oven, and immediately turn it out of the pan onto a rack to cool. This focaccia lends itself beautifully to stuffing, either savory or sweet. Here are two variations: one for a savory cheese version, one for a sweet breakfast treat featuring golden raisins. The directions below call for you to divide the dough in half and bake it in two 9" x 13" pans. If you prefer, don't divide the dough, and bake it in an 18" x 13" pan. Prepare the focaccia dough as directed above, dividing it in half. Shape the two pieces of dough into rough 12" x 8" rectangles, and lay them down on a lightly greased work surface. Spread each piece of dough with 2/3 cup crumbled or diced cheese of your choice, leaving about 1" bare all around the edges. Fold two opposite edges into the center, like you're folding a letter; then fold the two ends into the center, again like a letter. You will have made a filled square. Gently press to flatten. Place the filled breads into the prepared pans, and gently flatten them some more. Wait 15 minutes, and flatten again, pressing them as flat as you can without exposing the filling; you should be able to press this soft dough almost to the corners of the pan. Allow the focaccia to rise, covered, for about 3 hours. Towards the end of the rising time, preheat the oven to 400°F. Just before baking, spritz the focaccia heavily with warm water. Drizzle it with olive oil (enough to collect a bit in the dimples), then sprinkle with rosemary (or the herb of your choice), black pepper, and a tiny bit of coarse salt. Bake as directed in the original recipe. Prepare the focaccia dough as directed above. Spray two 9" x 13" pans with non-stick vegetable oil spray, but don't drizzle with olive oil. Once you've used your hands to shape the two pieces of dough into rough 12" x 8" rectangles, lay them down on a lightly greased work surface. Spread each piece of dough with 2/3 cup golden raisins, leaving about 1" bare all around the edges. Fold two opposite edges into the center, like you're folding a letter; then fold the two ends into the center, again like a letter. You will have made a raisin-filled square. Gently press to flatten. Place the raisin-filled focaccias into the prepared pans, and gently flatten them some more. Wait 15 minutes, and flatten again, pressing them as flat as you can without exposing the raisins; you should be able to press this soft dough almost to the corners of the pan. Just before baking, spritz the focaccia heavily with warm water, and sprinkle with 1/2 cup (1/4 cup on each focaccia) coarse sparkling sugar, demerara sugar, or a combination. The overnight starter and extra-long rise in the pan do two lovely things for your focaccia. First, they give the yeast a chance to grow and really do its work, resulting in light-as-air flatbread with an appealing bit of chew. And second, as the yeast grows it releases organic acids and alcohol, both of which contribute immeasurably to the focaccia's flavor. Feel free to experiment with toppings. Try some thyme or oregano in place of the rosemary. Scatter some feta cheese on top halfway through the baking time. While the classic version is topped very simply, we Americans have never been very good at leaving well enough alone!